Bangalore: The National Association of Software and Services Companies (NASSCOM) in partnership with Everest Group today announced the key findings of a report titled “Seizing the Robotic Process Automation (RPA) Market Opportunity” to showcase the impact of RPA in the BPM sector in India. The report will be formally released at a special panel at the annual NASSCOM BPM Summit 2015 being organized in Bangalore from September 24, 2015 to September 25, 2015. As per the report, technology and automation are fast emerging as one of key levers to create best-in-class Business Process Management (BPM) outcomes. 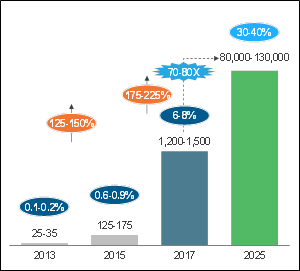 Robotic Process Automation (RPA) is now emerging as an unassisted automation approach that offers high value creation at relatively lower risk along with opportunity significant cost savings, better service delivery & manageability, and quicker time-to-value. Adopting new technologies has been the key success parameter of the Indian BPM industry, as there is clear evidence of technology creating best-in-class BPM outcomes for customers in the past. Companies have always strived to build new domain expertise and adopt new tools. RPA, despite being among the newest technologies, has swiftly becoming one of the most important ones in the BPM space. “In an increasingly dynamic and often volatile business environment, organizations increasingly seek ways to create greater value while minimizing risk. RPA offers that opportunity. 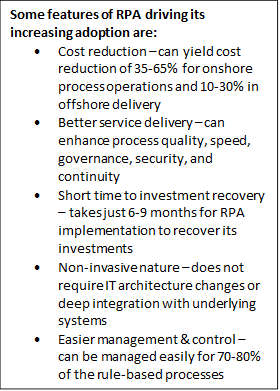 This study clearly shows that RPA is fast moving from a pioneering stage to a rapid growth phase of adoption. If leveraged strategically along with other value creation levers, it has the potential to unlock significant value for the BPM industry”, said Rajesh Ranjan, Partner, Everest Group and one of the authors of the report. With, the BPM industry growing exponentially owing to the germination of new service offerings for high value opportunities, the underlying solution elements of BPM industry needs to align to the “new world reality”. Technology is an important lever to make it happen and the RPA report will help in mapping and catering to the ‘unknown’ and ‘unmet’ needs of the customers.